What does it mean to visit a place one has heard of, thinks about, plans a big art project around and then to finally get there? 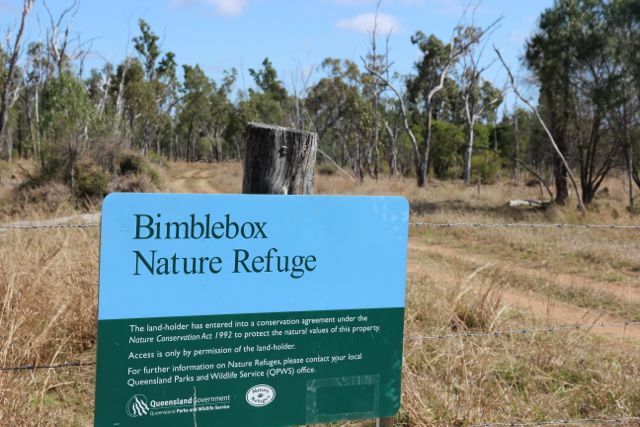 I had seen photos of Bimblebox Nature Refuge, I had read about its history. 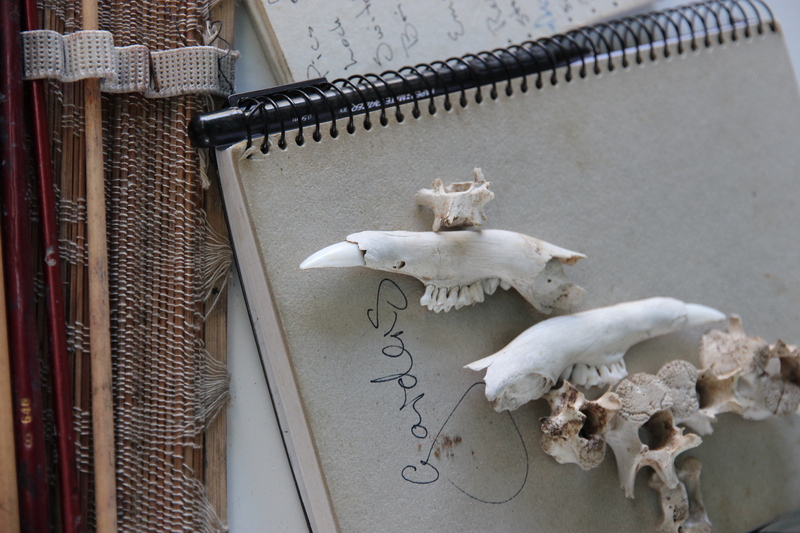 I had reviewed lists of its flora, bird surveys and fauna. Purchased books so I could identify its vegetation. Pulled together various art materials in order to make my own study and creative exploration of this area. And then, after months of planning, my physical journey to Bimblebox began. This journey started with yet another bad night’s sleep. A car partly packed and a last minute scramble to find room for Maureen’s bags of food and food preparation equipment brought up from Brisbane late the previous night by my husband. My two young children getting ready for school and their International day performance and torn in two because they didn’t want their Mum to be going away for almost two weeks (especially not on that particular day) and a car tyre with a slow leak. The plan was of course to leave early and drive as far as I could on the early morning wide-awake energy – now just getting to Dalby (an hour’s drive from home) became the first goal. And getting to Dalby became the most complex part of the journey. I missed the turn, which would have taken me on the shortest route, only realising much later. Subsequently I meandered way out of my way and it is only when I returned home almost two weeks later that I discovered why I had missed that crucial turn. The signpost had been wiped out and lay twisted and destroyed in a ditch beside the road. At the start of my journey I thought that if I can get lost driving between home and Dalby, how on earth would I ever find my way out to the Bimblebox Nature Refuge? But find it we did. 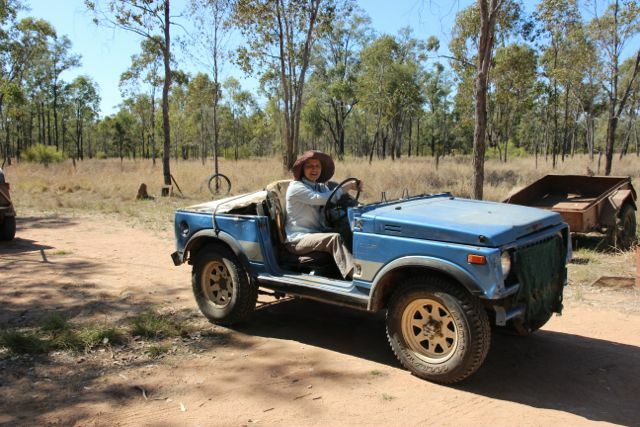 I met Glenda and Maureen (who had driven that morning from Brisbane) in Dalby after having my car tyre seen to and we continued our journey north west. 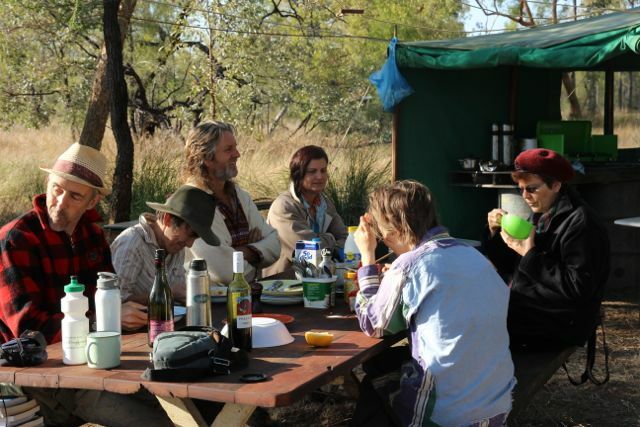 Our first night was spent at Telco farm stay with Susan and Glenn Telford, 65 km north of Roma on the Carnarvon Hwy. We enjoyed dinner and conversation then a good night’s sleep before continuing on toward Bimblebox. 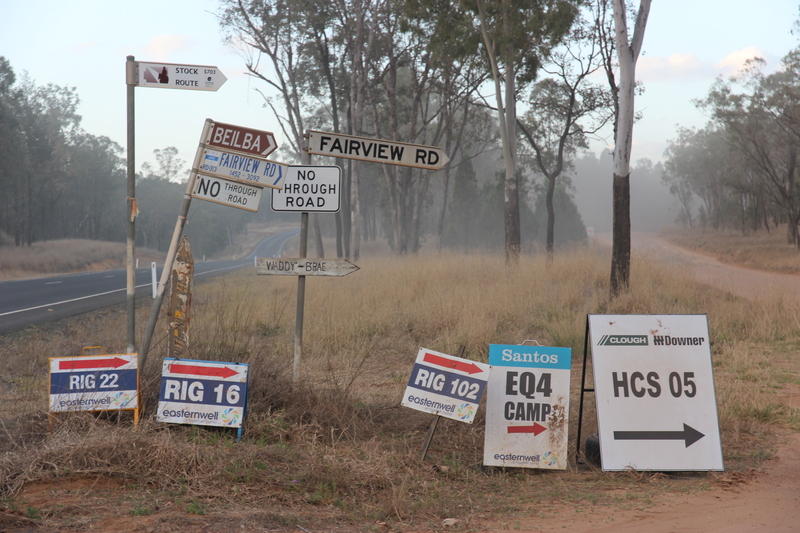 Many roads leading off the Carnarvon Hwy bristled with signposts for mining and gas developments. We arrived late afternoon at Bimblebox Nature Refuge feeling very happy to have made the journey safely. It was amazing to be at Bimblebox, meeting the Artists and our hosts for the very first time. After months of electronic communication and some phone conversations here we all were on Bimblebox, the property which has gained almost mythic proportions in the consciousness of many Australians. As the evening was drawing in very quickly we set about putting up tents while our wonderful cooks – Maureen and Edna immediately began work on the first of many communal meals. Over the course of our ten day art residency Maureen and Edna created the most delicious and nourishing meals bringing us together throughout each day. 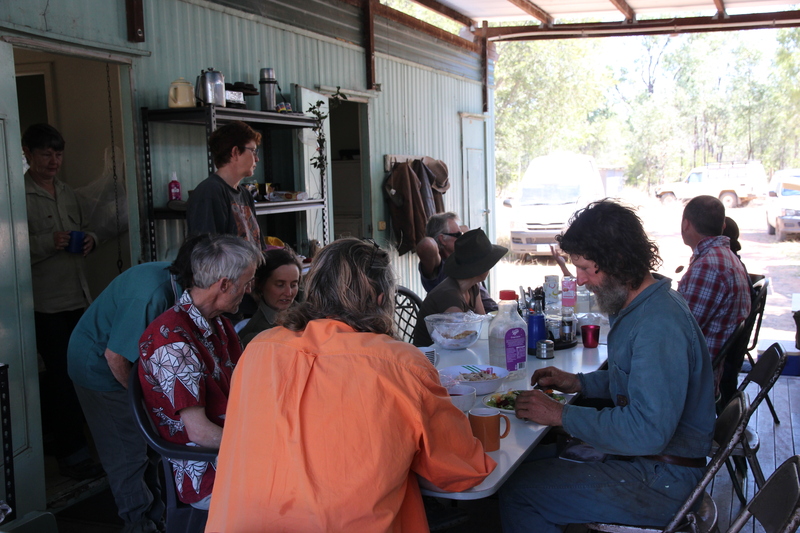 Our numbers fluctuated variously over the course of ten days and at times they were cooking for up to 20 people. A large portion of our food was fresh produce and meat grown by Ian, Paola and Karl, while Sonya milked a couple of cows each day to keep us in fresh milk. We were so wonderfully catered for! Many of us met for the first time on Bimblebox. And it is always interesting making the mental adjustment from the imagined image one has of a person when e-mailing and speaking on the phone, to the real person standing before us who is new but already quite well known. On our first evening at Bimblebox, within an hour of arriving I sprained my ankle quite badly. I was unloading the essentials from the pod attached to the roof-rack of my car and slipped. Landing squarely on my feet there was a moment before my left foot, which had landed in a depression in the ground, twisted over and I heard/felt a crack in my ankle as it was pushed out further then it had ever been before. I thought it was broken and that that was the end of my Bimblebox Art Project experience. Thank you to Liz, Ian, John and Glenda for their first aid over that next 24 hours. After ascertaining that it wasn’t broken there was application of ice, elevation of limb, home grown ointment, lots of good advice, practical help and encouragement that it will improve over the next few days. Sunday morning waking up to the sound of the many bird calls was magical. Starting with one, then two different birdcalls and reaching a cacophony of beautiful song after several minutes. Every morning the birdcalls were a joy and something I will always remember. That morning Karl made me a crutch from a sapling and his on farm ingenuity meant I could move a little more comfortably when I needed to. Because I had to stay put Alison and Karl set me up with some freshly cut grass and Alison showed me how to start a coiled form and I was away. 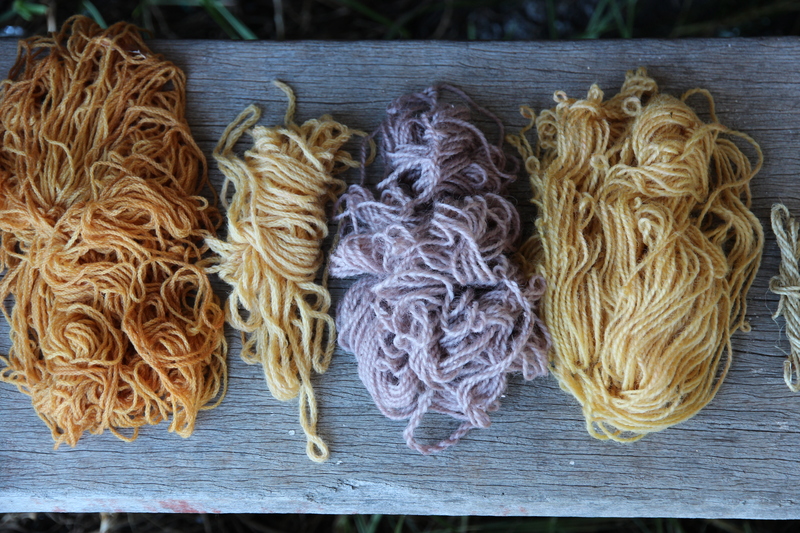 I used my natural dyed wool yarn to stitch the coils and didn’t look back. I was happily making something while exploring the local materials. Late morning Sonya took us around some of the property while she set out licks for the cattle. 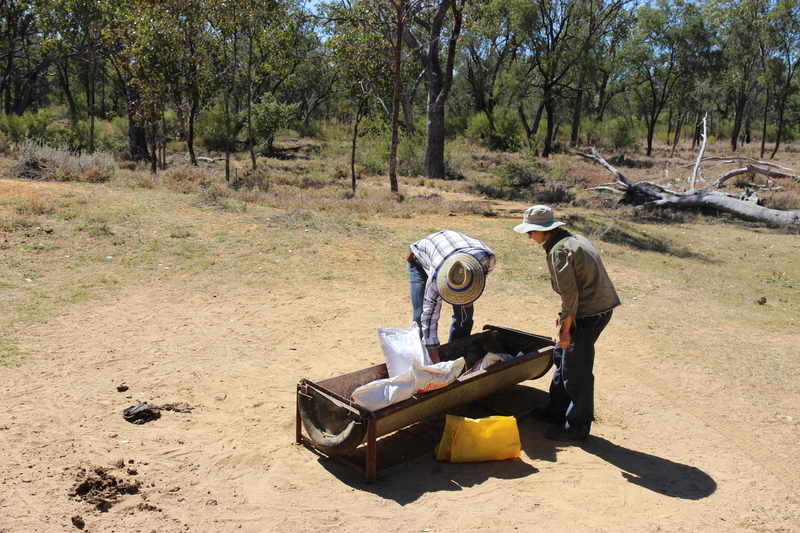 I went out with them, but mostly stayed on the ute during our several stops. 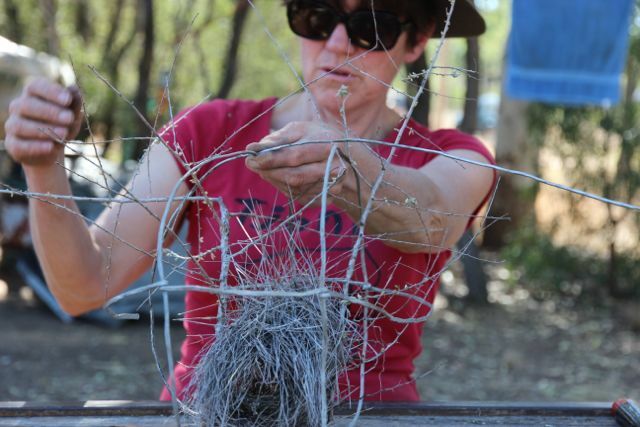 As I was unable to go too far on my ankle I was lucky enough to be brought flowers, leaves, seedpods and other interesting objects from the environments explored at each stop. Each of the artists made various studies – collecting natural materials, taking photographs, observing and listening as well as drawing. We saw an emu herding his wayward striped chicks, many kangaroos as well as a host of different birdlife. Late in the afternoon another trip out to set out cattle licks in other parts of the property was organised, but unfortunately I thought I should stay back and quietly keep my ankle elevated. It was on this excursion that the artists could see the difference between the nature refuge bursting with life and across the fence where the adjoining property had been cleared and blade ploughed. By day three I was starting to get around a bit more and took a trip to the yards with Sonya when she went to milk the cow. At last I was getting out to see what was beyond base camp. 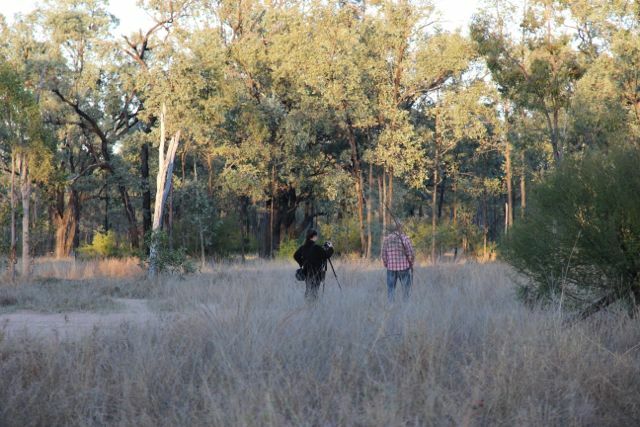 Alison and Boyd were already there recording both sound and photographic images. 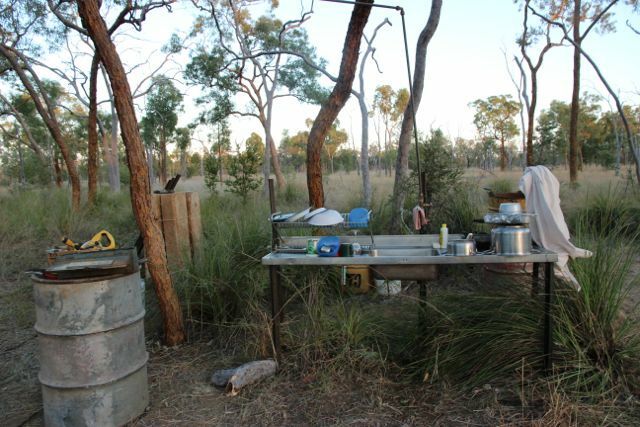 I continued with my coiling but also started to get out to take some photos and explore the ironbark forests around our first camp. 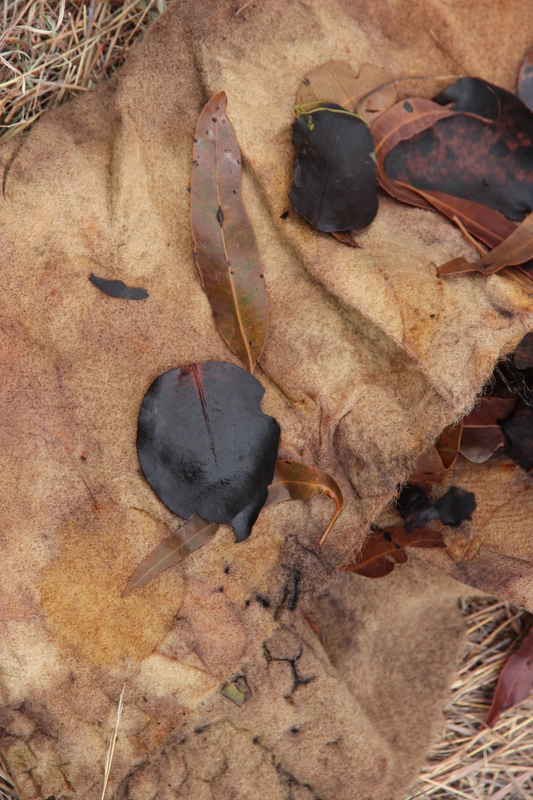 It was also time to retrieve my dye pots from the car and begin the process of exploring the vegetation for its ability to imprint on fabrics. Over the past few months I had been collecting old woollen blankets from charity shops. 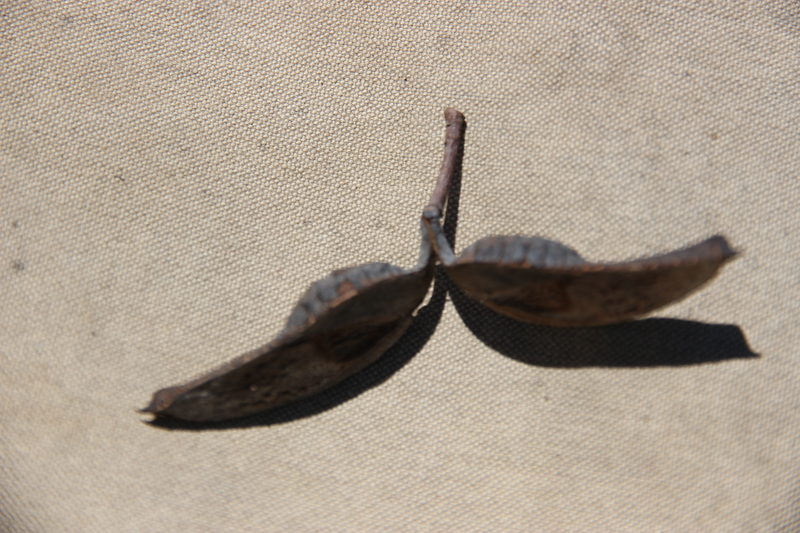 Most are frayed, stained and with little holes in some places. Some of the blankets I found were in very good condition and I couldn’t cut them up (I would find myself poised with the scissors, unable to make the first cut). 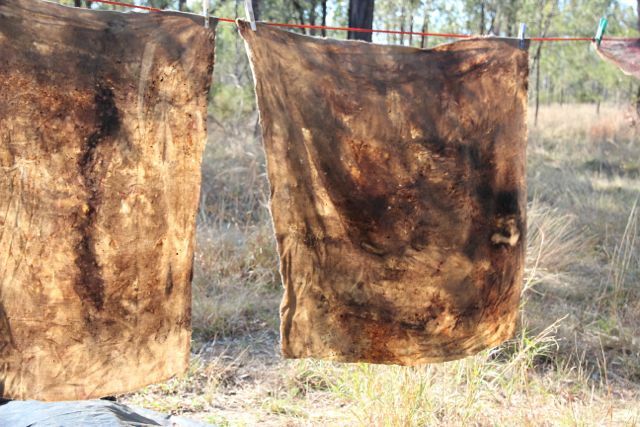 I began to have an appreciation of the blankets I found, enjoying their texture, marks, pieces lost and also the labels showing they were proudly made in Australia of Australian wool. What was their life before they came to me? Who held them, washed them, had the blankets tucked around them. These blankets would have welcomed new life and comforted those at the end of life. Blankets are evocative of childhood comfort on cold winter nights, tucked in by Mum, safe and warm until morning. But there have been times in Australian history when blankets were handed out to the people whose land was stolen from them. Blankets necessary against the cold. 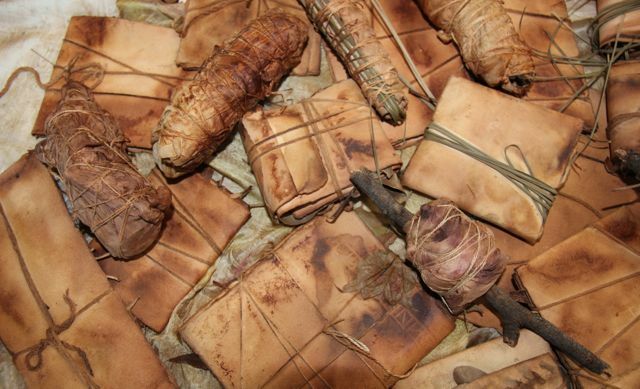 Blankets rough and scratchy, no balm for lost culture, lost family, stolen land. I had to fit the dye pots on the stovetop when Cook gave me the ok (too dry to light campfires). Each morning we had a little discussion about when I could use the stove. 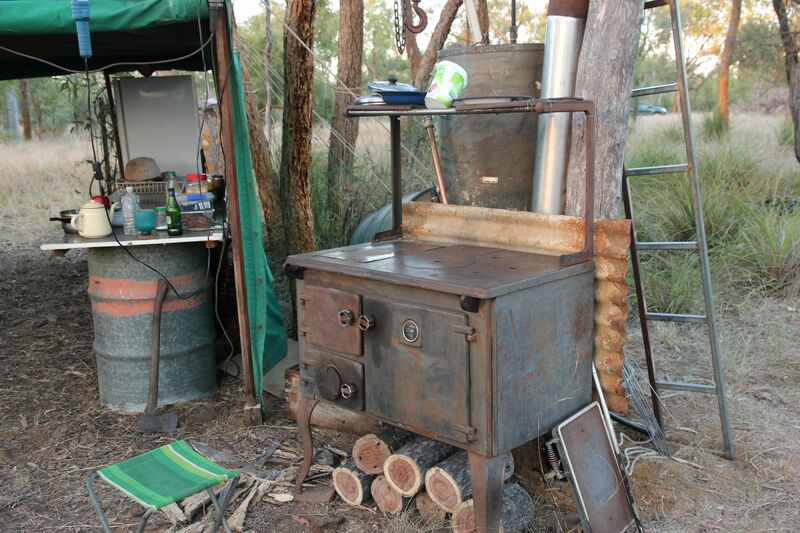 However it was not until we moved out to the other camp where we had a large wood burning stove that myself and my dye process really found our feet! Meanwhile the other artists were working at documenting Bimblebox in their own unique ways. Gerald Soworka set up his chair in the shade and began drawing a panorama. Donna Davis made dawn excursions to catch the best morning light photographing and documenting various plants also using a pocket zoom to get up close to the structure of the plants. Alison Clouston and Boyd explored sound and imagery in the environment and its inhabitants. Including the use of a motion sensor camera set up to record what we humans don’t usually get to see. 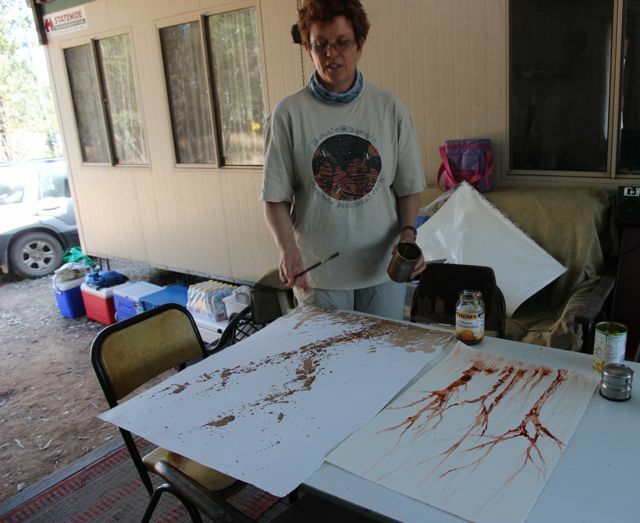 Glenda Orr explored the natural environment, collecting, photographing and also using tree sap to ‘draw’ with. 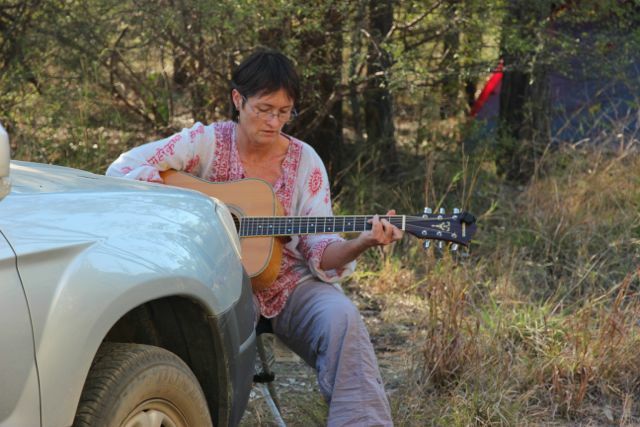 Liz Mahood delved into written work, music and the surrounding environment to explore what it is she wanted to say about Bimblebox. 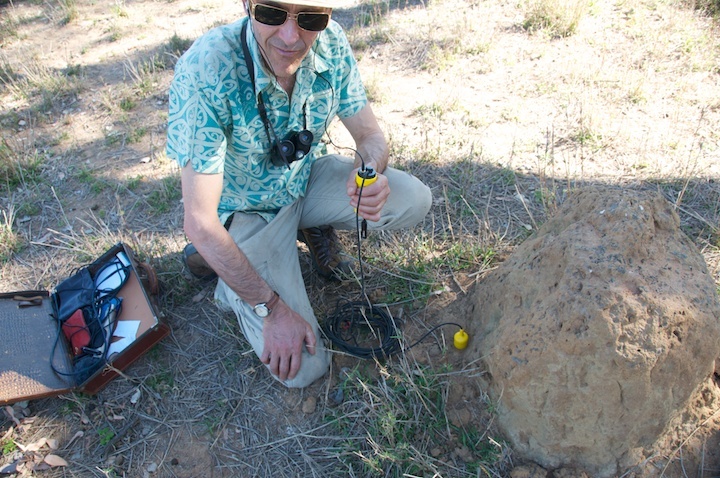 Especially looking at the layers of leaf mould that describes the health of these Australian soils. 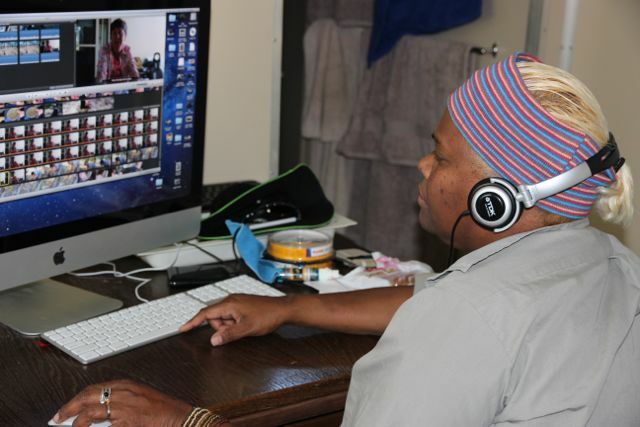 Kaylene Butler arrived with her flip camera and continued her documentation of the camp that she had begun on the journey to Bimblebox. 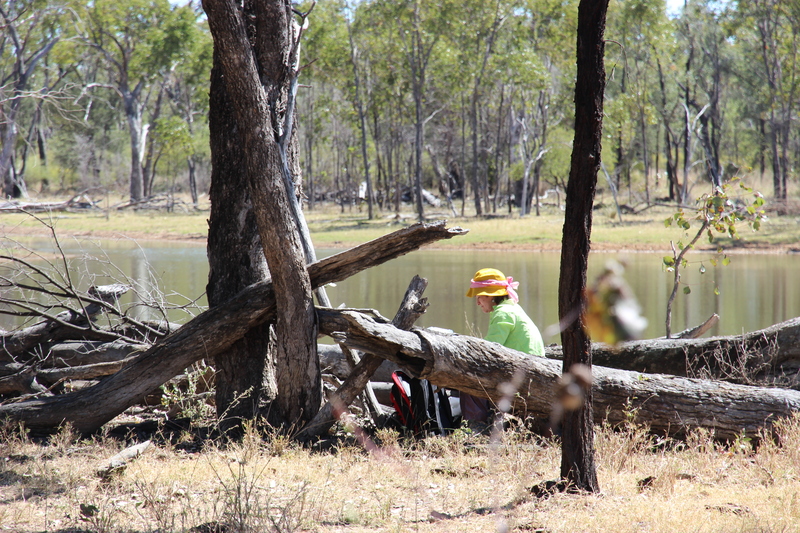 Howard Butler, with his daughter Sarah, went out into the bushland to find timbers suitable for making into cultural objects. 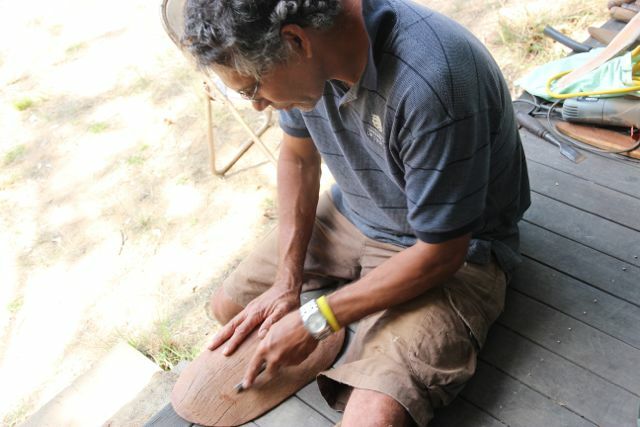 Howard began work on coolamons a boomarang and a bull roarer. It was a great privilege for me to see these beautiful objects emerge from the timber that Howard and Sarah brought back from their walks. I had always wanted to hold a coolamon having seen them displayed in Museums and galleries. I was able to feel its weight and balance as it came to life. 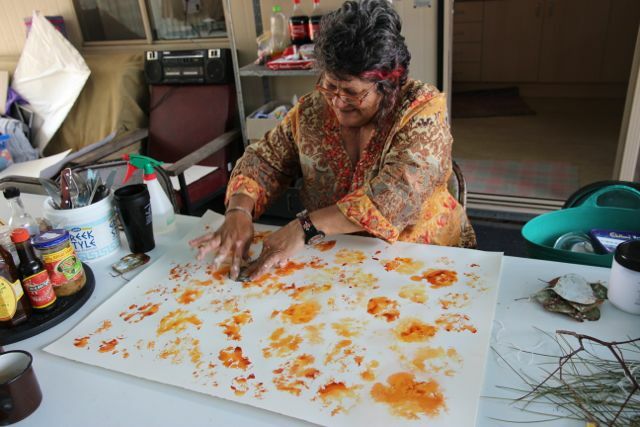 Dr Pamela Croft Warcon began by looking at her surrounding environment and collecting objects for inclusion in her work. These objects became part of a photographic tableau, put together on the final day. Pamela, Kaylene and Howard painted on a large canvas laid out on the table, collaborating to describe the surrounding environment. 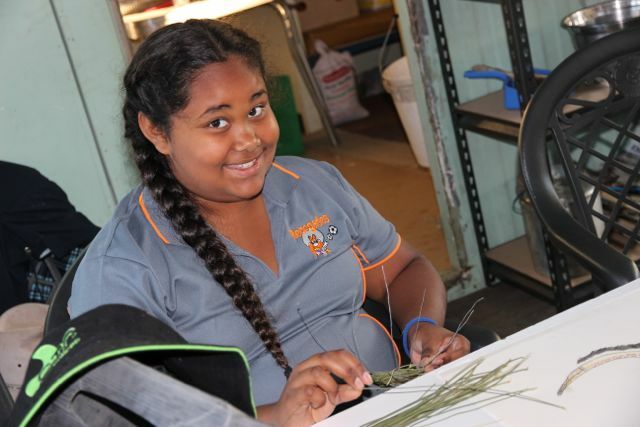 Sarah coiled needle like leaves into a nest like structure. Jude Roberts, with her rolls of beautiful hand-made papers, quickly got into the swing of things. Jude left paper in watering points of all kinds and over several days would see what took from the water into the paper. She also took imprints of trees and fence lines. As one day followed another it was a wonderful atmosphere of exploring, sharing and learning about our environment, about each other and about our various art practices. 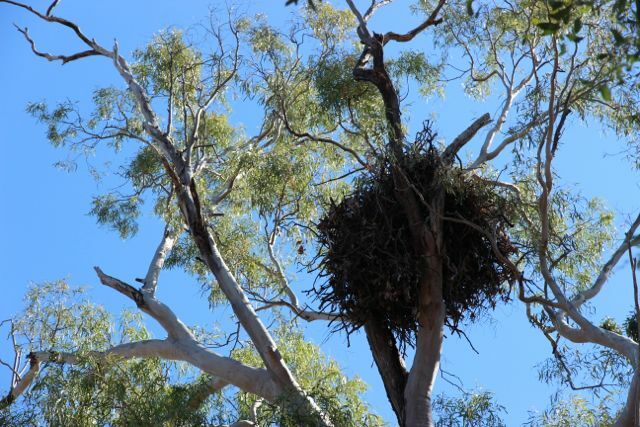 Maureen and Edna returned from one of their bird watching walks where they had seen a pair of striated pardalotes preparing a nest in a crack in a tree. Edna took me out to see it and we could see the tiny birds going in and out on the side of the tree. 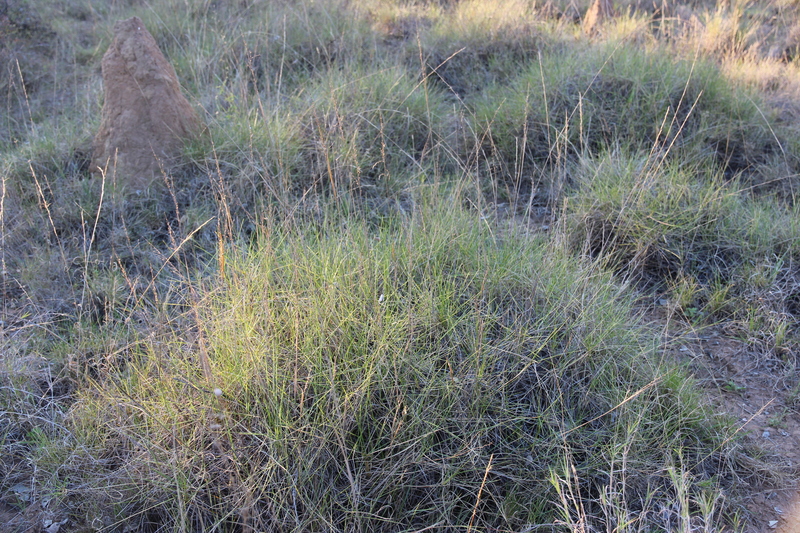 Around this area were mounds of spinifex and between the spinifex I found tiny sundews stuck all over with dead ants and tiny insects. The plants are a gorgeous blend of reds into greens with tiny hairs and glistening moisture droplets. Absolutely beautiful to look at, but of course lethal to insects. 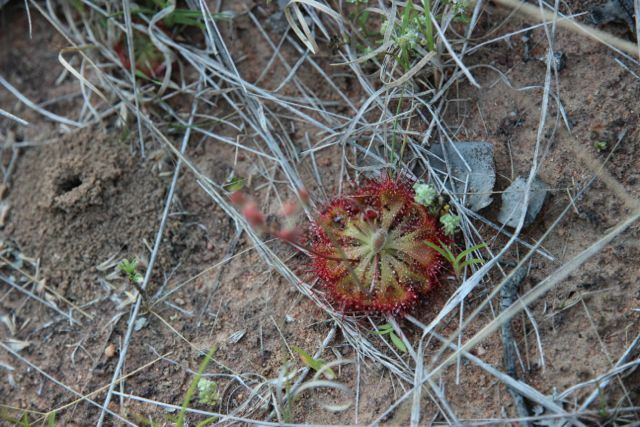 It is only now, when I look at the vegetation list of Bimblebox do I see that there are three kinds of sundew growing on Bimblebox I think I quite possibly saw two types, the second one with longer spoon shaped leaves. These finds at Bimblebox made me think more about the environments that once existed across Australia. On one of our drives a blaze of red covering a single bush caught our eye. It’s colour a surprise amongst the predominant silvers and grey greens of leaves and grasses. 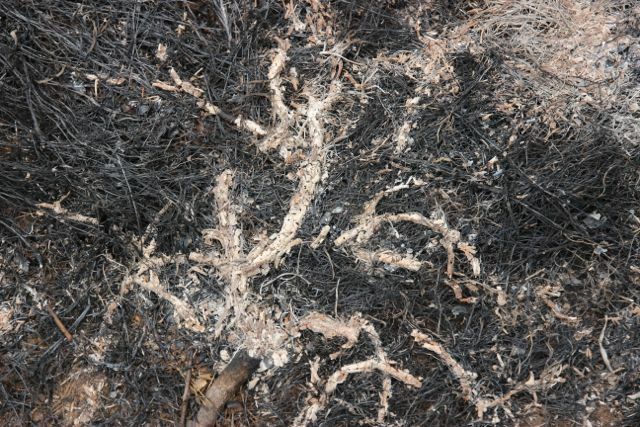 On closer investigation it was found to be a flame Hakea. Nearby what looked like a rosewood tree – a kind of timber from our pioneering past that I had only read about but never seen. At our second camp we set our tents amongst the most beautiful trees with their pale yellow bark and fresh green, elongated leaves that rustled in the breezes. 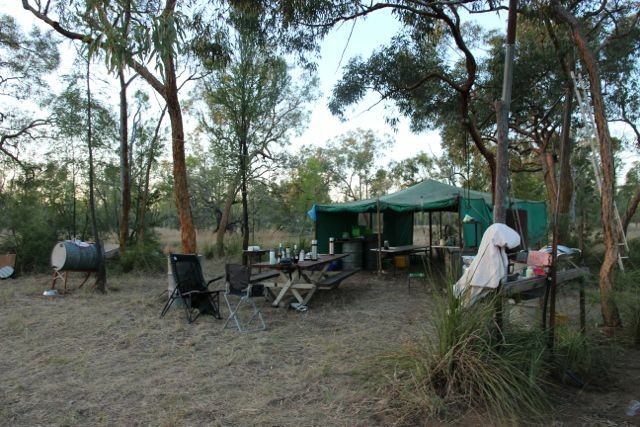 We camped amongst this stand of Corymbia Leichhardtii in open grassland edged around with yellow flowering grevilleas. Here the land began to transition into what is called the heathland. 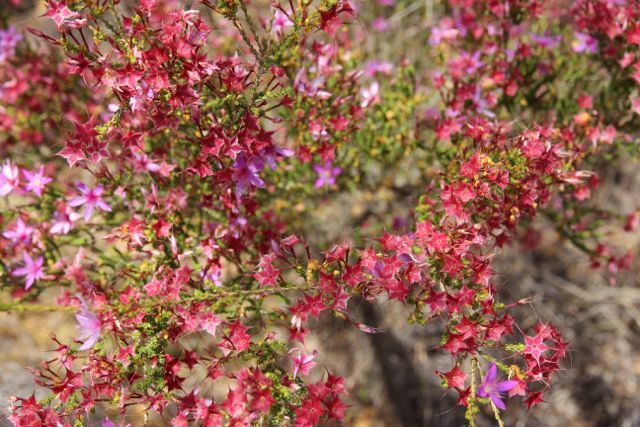 An area full of flowering shrubs, busy honeyeaters and buzzing native bees of all shapes, sizes and colours. I think what has opened my eyes about Bimblebox is the diversity of plant and animal life where at first glance one assumes there is very little diversity. While the silver leaf ironbark forests and waving native grasses appear to go on forever, there are many pockets of change in this unrelentingly flat landscape. Much of the colour and diversity of this country could be missed depending on the time of year you visit Bimblebox. 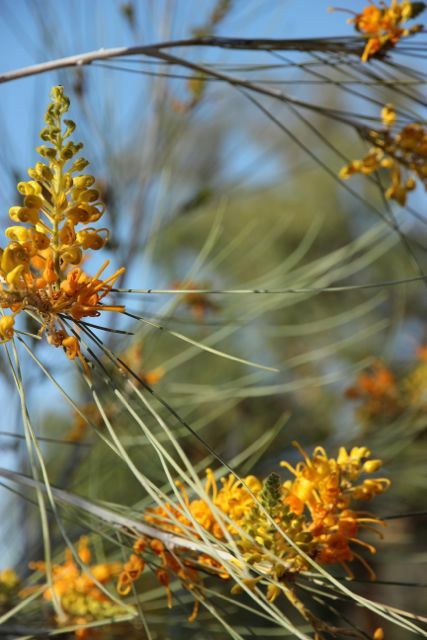 I assume we had missed most of the wattles flowering, but we were there to see gorgeous hakeas, grevilleas and some of the tiny eremophila flowers, plus many more flowering plants I was unfamiliar with. Some of the larger trees were just coming into bud and I wished we could stay to see them bloom. Bimblebox is a place I could live on through the course of a year and track the seasons through the movement of its wildlife and the reproductive cycles of its many and varied plant life. As I looked across the fence from the heathlands into the neighbouring property I wondered how much further this heathland used to extend. 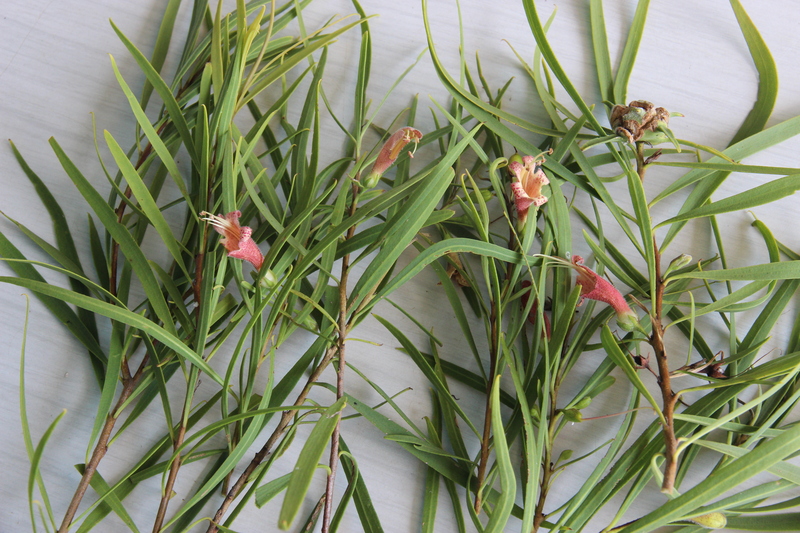 The artificial boundaries of colonial Australia did not take into account the diverse vegetation they were to push through and cut into same sized geometric patterns. I gazed across the fence and also wondered how much have we already lost that we do not know about. 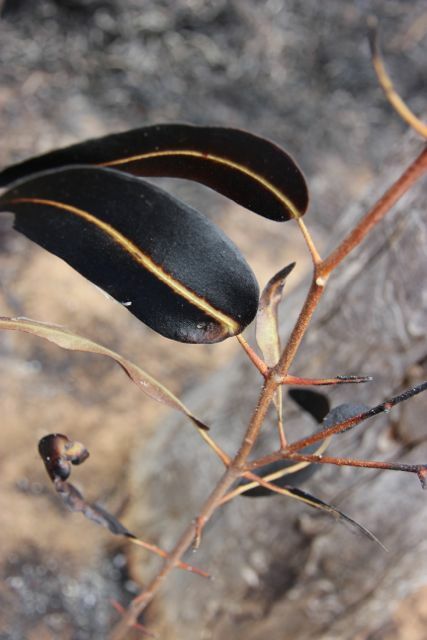 What amazing plant life and wildlife did the First Australians know that cannot be seen today? Areas that our pioneering ancestors rode over the top of with their horses, grazing animals, axes, then bulldozers. 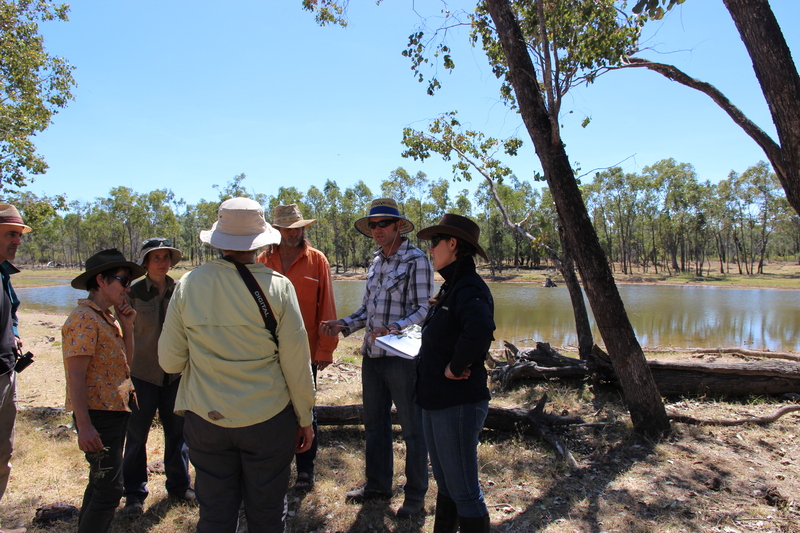 How was this landscape known and used by our First Australians? In a neighbouring property a drilling rig pounded deep into the earth – a relentless percussion sounding a death knell, its core samples writing the mining company’s case for the destruction of Bimblebox Nature Refuge. 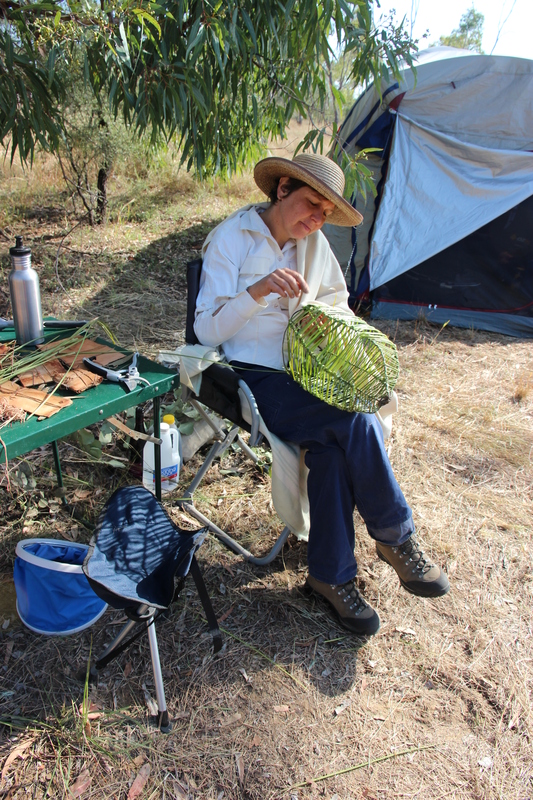 Just before Howard, Kaylene, Pamela and Sarah left us to return to the Rockhampton region, Howard brought us some sandlewood leaves he had picked on Bimblebox. He left some with us for a smoking ceremony. Sandlewood to smoke our camp site, last picked and used on this area of land how very many years ago? A link with the old ones of this land who knew it so well, to our present time and our own desire to know this land in some intimate way and to capture it creatively in a very short space of time. I did not want to leave Bimblebox. I had had the most wonderful ten days. There was so much more I wanted to look at, to find, to try to capture. On my last day Karl and I took some paper into the areas burnt off the previous night and had some fun pushing the paper into the ash to see what marks we could imprint. Then Karl made some smoke and burn marks using a smouldering stick. 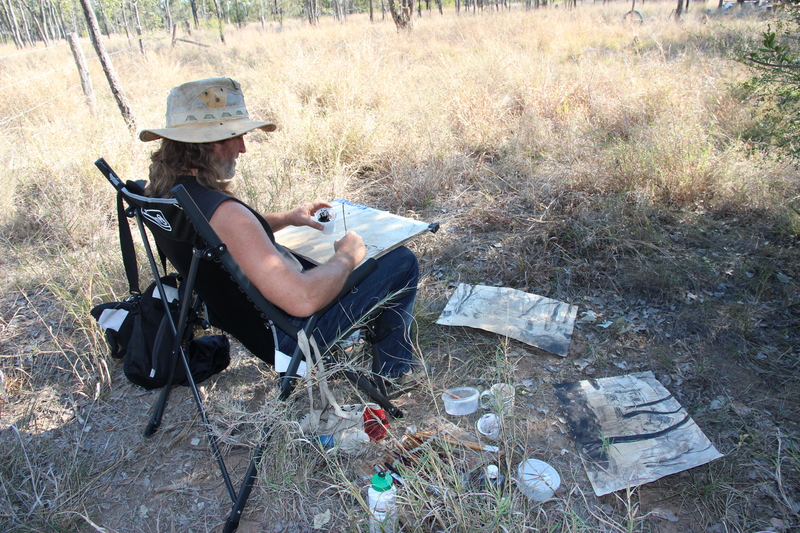 I collected some leaf litter, seed pods and grasses so I could continue my Bimblebox artworks on my return home. I finished my lomandra pieces under the pale torchlight and glow of the stars above. These shiny green, long strappy leaves grew around our kitchen camp area. 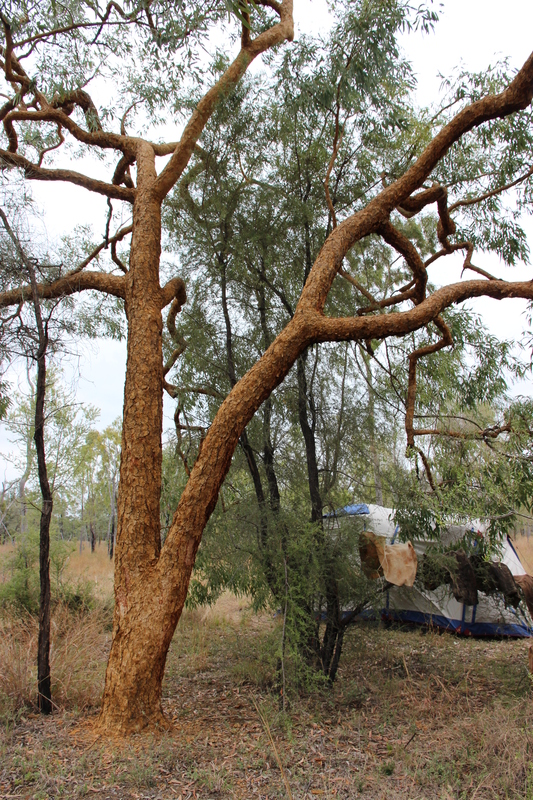 I had my last shower in the evening air under the rustling leaves of the Corymbia Leichhardtii trees. One last night, I woke before dawn to the sound of the patter of light rain on the tent. A baby tawny frogmouth called from a nearby tree and again I was lucky to hear dingoes howling mournfully into the starry sky a couple of hours before the start of the dawn chorus of birdsong. 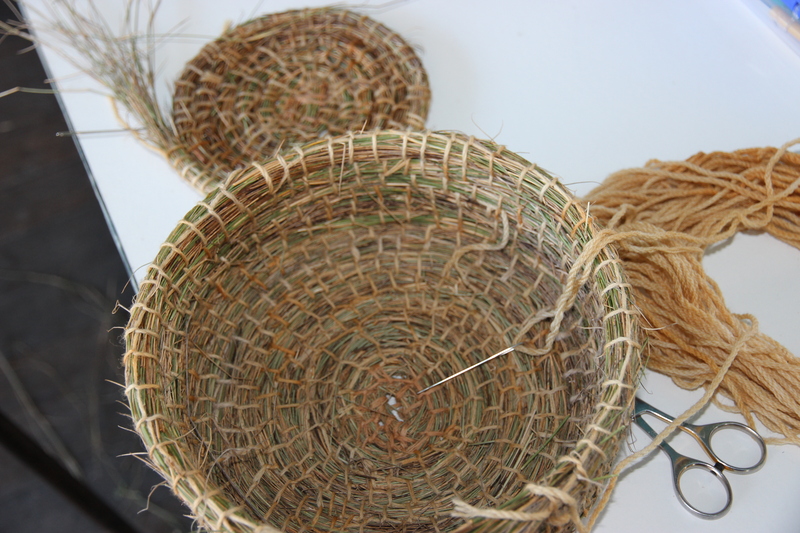 Back home I am again working on coiling the grass I collected whilst at Bimblebox. This time the grass is rapidly drying out and due to time constraints and drying grass I am only able to make one coiled form. I look at the remaining grass and think I cannot destroy it. What can I do with it? 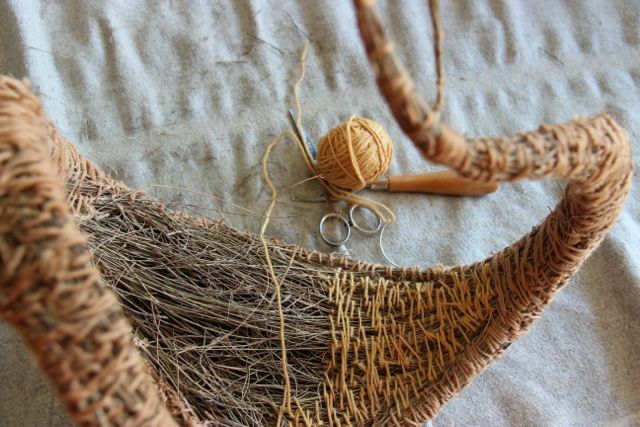 Handling the grass and looking at it, a shape suggests itself and I find that very soon I am stitching the grass into something new and something beautiful. While stitching I reflect on Bimblebox and my time there. I wonder what the future will hold for Bimblebox and indeed our planet. Now that I have been there, visited and explored some of the Nature Refuge I cannot imagine how anybody could give this place of so much life over to the destructive production of coal. 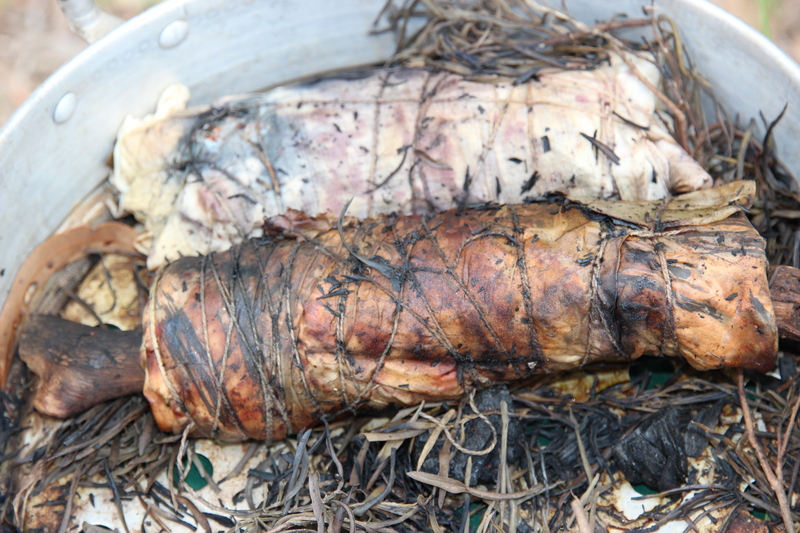 It is simply not enough to say – oh well the wildlife can just go somewhere else. There is nowhere else to go. The Clearing of the majority of Bimblebox will simply mean the death of countless native animals along with the senseless destruction of incredibly diverse and mature ecosystems. These ecosystems cannot be replaced. The encouragement by governments and communities to farmers to work the land for the future health of that farmland is pointless when a mining company can come and completely destroy all the work and careful future planning that that farmer has done. Farming is part of the future of the human race and farmers are part of the solution to the problems our planet faces. We can live without coal. We Cannot live without food, clean air and clean water. When I look on the internet at maps for the proposed mines for the Galilee Basin and see how vast the tracts of land are that may be taken into those mining leases. Read the statistics on the amount of coal that is projected to be mined, exported and burnt and what that means to world pollution. Add to this the already existing mines, the proposed 40 000 coal seam gas wells and all the various forms of infrastructure needed for these industries – pipelines, rail lines, water infrastructure, roads, sea ports, etc. I wonder where will all those displaced people live? How will we grow our food. 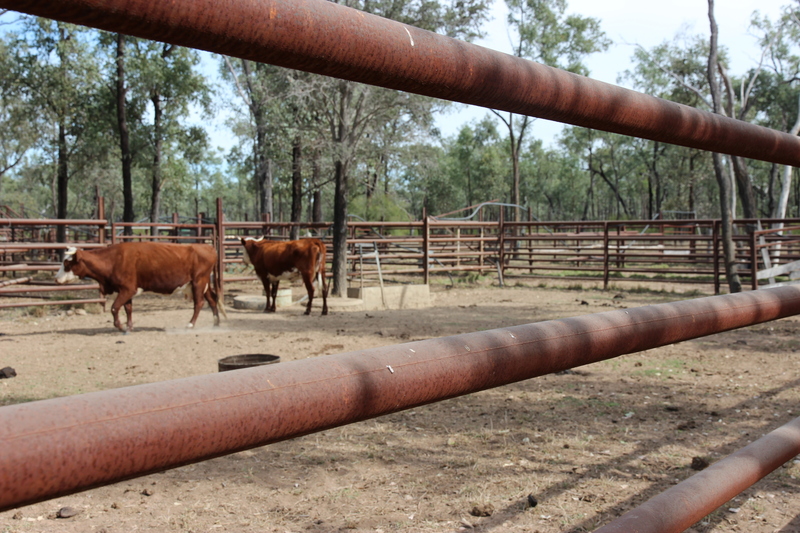 Will a drive through Qld become a broad vista of mining and gas infrastructure? Will there be no natural ecosystems left for our Grandchildren to visit, study, marvel at or to enjoy. 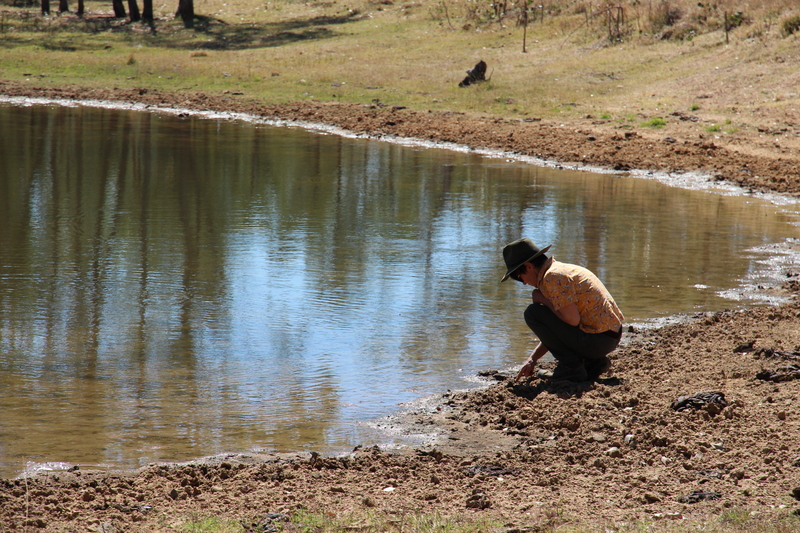 We know that rehabilitated mining land is no good for agricultural use which means mined land is an endpoint for human land use. 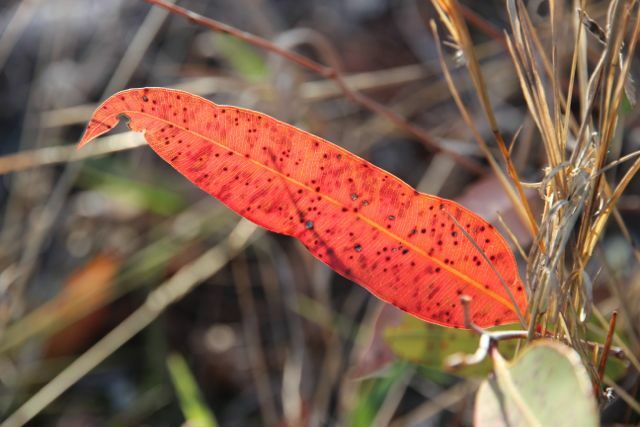 Rehabilitation of mining land can be done relatively well, or very badly, but never perfectly, which means the quality of the replaced environment and biodiversity of our ecosystems is severely impacted, unable to be recreated. 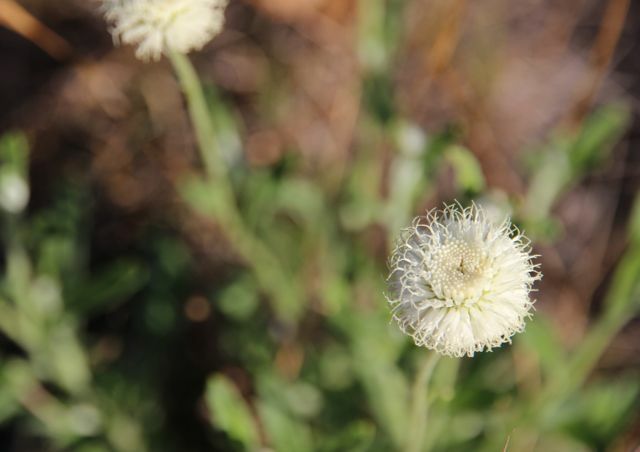 What native species will be left to inhabit any rehabilitated land? These decisions – on a human time scale – are forever. The Earth will not be destroyed – it will continue on into a future that we humans will have no part in. Does it make sense to plan our own extinction? We can make a different choice! Let us choose a healthy future. Let us simply choose a future. Jill, thank you for putting it all into words so eloquently. Yes, we must choose a different future. We must stop dragging all this carbon out of the earth into our atmosphere, and killing the forests, woodlands and soils that can sequester it. Jill, a personal account but one with an overall sense of what many of us know we are loosing. Thank you Sue, good to hear of your response to Bimblebox also and how our experiences resonate in the same way.